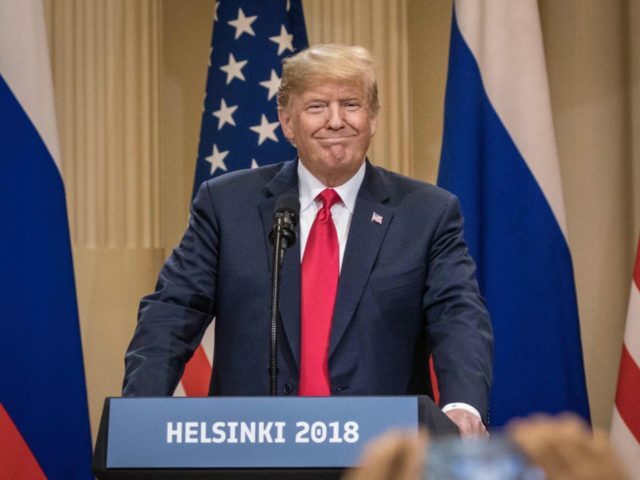 President Donald Trump has been criticized by the media and by Beltway politicians of both parties for his meeting with Russian president Vladimir Putin in Helsinki on Monday. But the summit has already produced a very significant win: namely, agreement to avoid a war in the Middle East by restraining Iran in Syria. As Breitbart News columnist Caroline Glick noted last month, it was crucial that Trump confront Putin over Syria, because Russia was about to allow Iranian and Hezbollah soldiers, dressed in Syrian uniforms, to move into southwestern Syria along the border with Israel and Jordan. That was not a situation that the U.S. or Israel could accept. The U.S. has a major interest as well in preventing Iran’s Hezbollah forces from deploying in Syria and in Yemen. The U.S. has an interest in preventing Russia from taking over Syria. … [T]he physical deployment of Iranian-controlled forces along the Syrian-Israeli border and the Syrian-Jordanian border all but ensures a major war between Israel and these forces — including Syrian military forces, which are also controlled by Iran. It raises the likelihood of a Jordanian war with these same forces to an unprecedented level. The Iranian-Israeli war will spread to Lebanon, which is controlled by Iran through Hezbollah. It can easily spread to Gaza as well, given Iran’s sponsorship of the Hamas terror regime that rules the area. North Korea, Glick added, would also interpret Iranian deployment along the Syrian border as a sign of American weakness, and U.S. allies around the world would once again lose confidence in America’s protection, as they did under President Barack Obama. But in the days leading up to Helsinki, the Trump administration maneuvered to constrain Russia’s options. The U.S. and Israel, exerting both military force in Syria and diplomatic pressure on Moscow, made clear that Putin would not have a free hand there. National Security Advisor John Bolton, Glick noted, announced that Trump was scrapping Obama’s policy of allowing Iran free reign within most of Syria, and would seek a new agreement with Russia that would move Iranian troops out of Syria altogether. Meanwhile, Israeli Prime Minister Benjamin Netanyahu publicly insisted on compliance with the Israel-Syria Separation of Forces Agreement of 1974, which was brokered by the United Nations, and which was credited with keeping the border quiet for decades. Fast-forward to the press conference on Monday. Putin, who spoke first, said that the U.S. and Russia had agreed on a new course of action in Syria: “The south of Syria should be brought to the full compliance with the treaty of 1974, about the separation of forces — about separation of forces of Israel and Syria. This will bring peace to Golan Heights, and bring [a] more peaceful relationship between Syria and Israel, and also to provide security of the state of Israel.” Trump also referred to the agreement in his remarks at the press conference, and suggested that both the U.S. and Russia had agreed with the Israeli position on the issue. Most of the Beltway journalists at the press conference were too busy asking about the 2016 election to ask about either Iran or Syria. But the Israeli media noticed — and so, too, did Yaroslav Trofimov, the Wall Street Journal‘s Middle East columnist, who reported that Putin had granted Israel’s request. While it was not clear whether the two leaders had agreed to push Iranian troops out of Syria, it is clear, as Glick observes, that Iranian troops cannot operate within Syria without the help of Russian air cover. On Tuesday, Trump told reporters at the White House that Putin was “very much involved now with us” on guaranteeing Israeli security in Syria. Whether Putin follows through remains to be seen, but it is certainly a step in the right direction — of peace. And so while Trump’s critics compete to show how outraged they are that he even shared a stage with Putin, and the opposition accuses him of treason, the president appears to have scored a victory for American interests in the Middle East. Perhaps eight years of failure under Obama, and years of frustration under George W. Bush, made Washington forget what success looks like.